BEANO COMIC No 1 £7,750.00, DANDY MONSTER COMIC 1 £5,665.00! 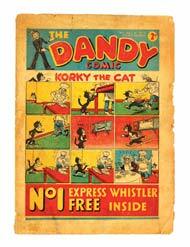 At the other end of the spectrum the first four and the back four pages of Dandy Comic 1 saw its bidding conclude at £148, where the successful bidder carried away first adventures of Korky, Desperate Dan, Jimmy And His Grockle and Keyhole Kate, maybe he also had the inside pages and was able to complete the comic. 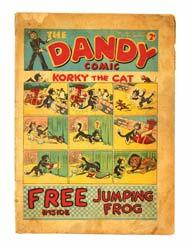 A copy of Dandy Comic 2 in worn, grubby condition was heavily bid to £313 and war years numbers of the Beano - 170 to 177 from 1942, averaged £70-100 each, mainly in the low grades of Good and Good Plus. In the middle of all this, and from the same era, a wonderful Lord Snooty artwork from the pen of Dudley Watkins celebrated Christmas at Bunkerton Castle where Snitchy and Snatchy, those terrible twins, waited up for Santa, and, convinced that he was a Nazi spy, set fire to his beard. Cue the following morning and a disgruntled head butler serving breakfast, his sore head in a bandage! £1045.00 was the winning bid for this hilarious piece. An earlier Desperate Dan piece from around 1939 showed Dan distraught when trying to give some puff to the kids model yachts and blowing them all to bits. He makes amends by pulling off a paddle-steamer wheel, uprooting a lamp-post and ripping away a grocer's shop blind and building his own Dan-Powered Sail Boat for the kids to command. The successful bidder sailed away with this piece for £616. 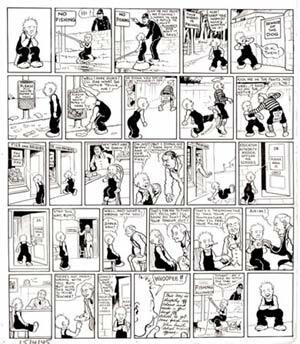 Oor Wullie's artwork from 1945 was also bid to £751 and in this 1945 adventure everyone was telling the wee lad whit to do includin' the Doc and PC Murdoch but Wullie finally gets a note off skool - and 2 days' ("No" painted out) Fishing allowance! 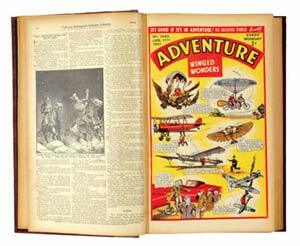 To complete the notable War years prices, four years of DC Thomson's Adventure from 1941-44, all in complete bound volumes, averaged £275-352 a year, or around £10 each (1942-44 were issued fortnightly due to paper and ink shortages). There were some very stark propaganda exhortations to save paper, one from 1943 entitled " the Axes For The Axis!" showing the beheading of Hitler and Hirohito by Tommies using axes made of waste paper! There will be Rover, Hotspur and Wizard volumes from the same era following on in our next catalogue. 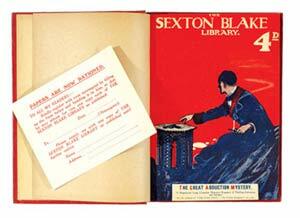 Our bound volume collection continues to flourish with the years prior to the 30s well represented. John Bull from 1906, 1-82 in 2 bound volumes was mainly a lampooning political paper with comment and cartoons and this title, now transformed as a stalwart in the English language, made a high winning bid of £220. 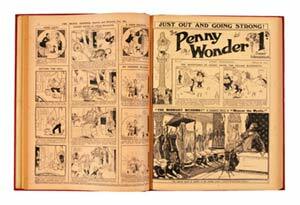 Penny Wonder from 1912, 1-47 made the same amount, as did Tiger Tim's Tales (1919) 1-24, a rare half-size comic featuring serene landscape illustrations to each cover. I would stress, as I have before, that volumes containing No 1 issues onwards will always fetch a premium over later issues, sometimes by double the value and more depending on the title's popularity. 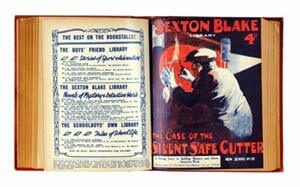 We offered five small bound volumes of Sexton Blake's second series from 1925, numbered 5-64 and these highly regarded and readable detective stories engendered fierce bidding finally being knocked down for £561 to a determined Yorkshireman. Our other Sexton Blake lot, from his third series in 1942, was numbered 52-79 in seven small bound volumes and showed its Stateside appeal as it found its way to Texas via a winning bid of £330. 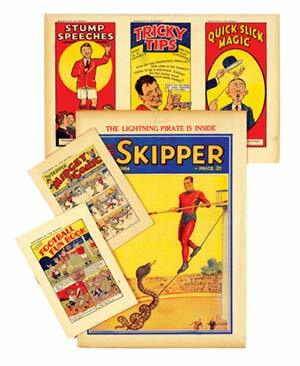 DC Thomson's The Skipper was one of the "Big Five" story papers that included Adventure, Hotspur, Rover and Wizard, but it only lasted for 543 issues between 1930-1941, falling victim to war years deprivation. 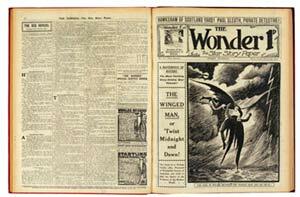 A near complete year from 1934 with some wonderful free gifts still intact made £198 or £4 a copy, a great value acquisition as the rare Skipper Midget Comic was one of the gifts. 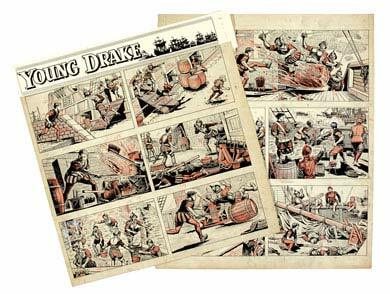 Our all action Young Drake artwork pages by Paddy Brennan for The Dandy found high bidding at £374 and there will be two further pages available in the November catalogue. There was a near complete run of The Eagle spanning its full 20 years before amalgamation with Lion and the early issues always do well, a Fine grade No1 selling at £150, No 2 at £55 and 3 and 4 making £33 each. When first issued in 1950, the print run was close to a million copies a week, a huge amount for that time, and many copies still survive today making most years quite available. Bidding can therefore range between £1 and £3 a copy (as ever, depending on grade) and our general results bore this out as bidders were quite prepared to offer £50-150 for complete years in vg/fn grades. 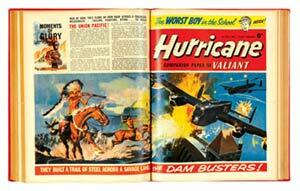 Just the first 18 issues were available in a bound volume of Hurricane but our (under) estimate of £70-100 was enthusiastically laid waste by a hurricane-force £495. TV 21 was also offered in a near complete run but this particular collection, generally Very Fine/Very Fine Plus, had the highest grades ever seen at auction and the resultant winning bids strongly reflected this. No 1 (without free gift) lifted off to £201, No 2 made a record £148, No 3; £75 and 4 and 5 £44 each. Five pounds was the lowest price per copy for issues between 81 and 199 but ten to fifteen the norm for the other numbers with £308 winning Nos. 21-30 (including the hard-to-find No 28 Doctor Who photo cover) and £309 took away the lower distribution final issues 200-242. 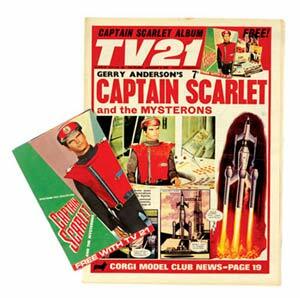 There were 2 further lots comprising 4 Summer and Thunderbirds Extras (£137) and TV21 and Joe 90 1-9 with Specials, cloth badges and Space Patrol centre pages from TV Comic (£120) all adding up to a staggering £3,166 of winning bids for this TV21 run which the vendor had kept in an old cardboard whiskey box from the day he bought them. Perhaps we should leave the high spirits pun…. 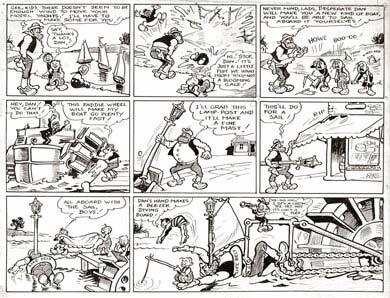 On Monday September 11 Keith Waterhouse reported in his Daily Mail column the sale of our Beano Comic No.1, devoting his article to all the comics and story papers he remembered as a child and all the free gifts that went with them. He spoke of Whoopee Masks, Express Whistlers and Sugar Sweets, of mid Thirties Jingles, Joker, Comic Cuts and Crackers titles, some printed on "vile green paper", and he discussed their eventual demise where now only The Beano and The Dandy remain as their superior stories and colour pages printed on sturdy paper have seen them safely through the years. Their content, he described, as "the same old freak show of talking animals, invisible men and elastic boys.." He surmised on the survival of these comics in general, doubting that they could re-invent themselves under the onslaught of TV in all its versions. Normally I would applaud any mainstream publicity concerning comics but Mr Waterhouse has completely missed the point. Not once in his double column article did the words, "fun" or "laugh" appear, not even "amuse". The glee with which children throughout the UK greeted the arrival of their favourite comics, laughingly devoured on the walk to school, united a nation of Biffo, Korky, Dennis The Menace and Desperate Dan daredevils most of whom today need no reminding of that Cactusville Cowboy's favourite meal. His antics and those of Lord Snooty, His Pals and Pansy Potter were legion. During the second World War, they defeated Hitler, Goering, Mussolini and Hirohito on a weekly basis with hilarious consequences. Hitler and Goering even got their own strip: "Addie And Hermy", spending most of the war looking for a decent meal. Brilliant. The Beano and Dandy are about fun, Mr W, that's why they'll survive, but if you would like to visit "the same old freak show", perhaps have a glance through the pages of your own organ, you might even get a laugh.